Aids Orphans Rising: H5N1 Bird Flu Scares Aids Orphans! H5N1 Bird Flu Scares Aids Orphans! 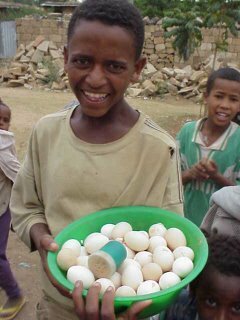 In Ethiopia the kids are not afraid of catching Avian Flu but more concerned that many of them will lose their source of income! This young fellow came to St. Lucy Center when he was just six years old. He was joined by his only living relative, his 3 year old brother. Sister started him on selling six eggs at a time. He now has his own house and a yard full of chicks that are able to support the two of them in good style. Many children are living off their own microenterprises. What can one person do to help halfway across the world? Perhaps you have some ideas of your own to help others get started!